The calibration of the laser detection is done in a simple assistant and takes only a few minutes. The exact procedure is described in the video above. The audio is only German so far but there are English and German subtitles. Create and shoot your own IPSC ranges yourself. Simply place walls, targets and other objects in the virtual world and create a motion path. Then set the number of shots at the different positions configure special actions like reloading and you're ready to go. In addition to the typical IPSC targets, steel targets and even moving targets are available. There also is a selection of walls, boxes, barrels and grass to beautify the landscape. The range files have the extension *.IPSC and must be located in the folder "IPSCRanges". To every *.IPSC file You can also copy a *.png file of the same name into the folder. This will serve as a preview in the selection menu. For example a screenshot from the editor (F1 key). Those who wont like to build ranges by themselfs will find a small collection already integrated in ARES. The player has to shoot cans and bottles from a fence as fast as possible. In this game a physics engine is used, which ensures that the cans and broken bottles fall in a realistic manner. 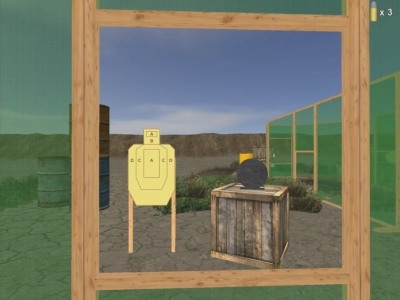 The player has a maximum of 8 shots and has to hit 5 targets as fast as possible. The acoustic start signal sounds at a random point in time. This game tests the player’s reactions to the highest level. The size of the targets is variable. 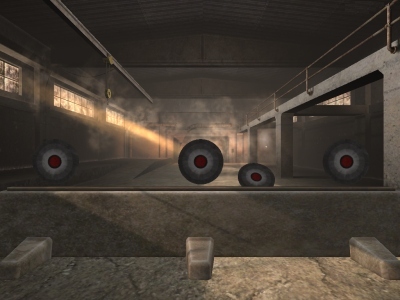 The player has 15 seconds in order to hit as many targets as possible. Only one target appears at a time. If this is hit, another target appears in a random position. In this game several types of target can be chosen and one’s own targets can also be used. For this purpose a 3D-model of the target in the *.MDL file format has to be copied into the folder “KlappscheibenZiele”. In each turn two clay piegons are launched and the player has two shots out of a shotgun to hit them. The number of turns ist adjustable as is the scattering of the gun (choke). The bullets are simulated physically correct so scattering and time to hit increase with the distance. Hence, all these factors must be taken into account to achieve a perfect hit. Much like the Plates game there a 5 targets taht must be hit as fast as possible. In the single-mode there are 5 cartridges available. In the relay mode there are 8 cartridges but every one after the first 5 must be loaded manually. In this game targets appear in random positions and disappear again after a short time period. The player has to hit these targets before they disappear. The faster the player hits a target, the more points are received. The game contains different levels. The higher the level, the more targets appear at the same time. If the player misses 3 targets, the game is over. In a grid 24 targets appear, 12 red-white ones and 12 red-black ones. The player has to hit all 12 white targets as fast as possible. If a black one is hit, a 5-second time penalty is added to the total time. The game is over when the player has hit all 12 white targets in all four stages. Videos in mpg, avi and wmv format can be used. For this purpose they have to be copied into the folder “Videos” in the program directory. After each shot the video is halted and the hit position is marked. Then the video can be continued or started again. It is also possible to automatically continiue after a short pause. To simulate distances a delay between the shot and the stoppig of the video can be set. A handy dialoge calcualtes the delay times accoding to the muzzle velocity and the distance. Unfortunately videos cannot be supplied due to copyright issues. If you have good free videos you want to share, you can give them to us then we will place them at everybody’s disposal. Simple target as you can find them an any shooting range. The number of shots per round is adjustable. Besides the targets packed in ARES it is possible to use any BMP-, PNG- or TGA-File. Therefore the file has to be copied in the folder named "Zielscheiben". For counting the score a second image file of the same type can be copied into the folder. The phrase "SCORE" has to be added to the filename of this second file. ARES then automatically matches the two files. In the score image the red color channel is used to determine how which score is awarded on which area of the target. A color value of 1 in the red channel leads to 0.1 points so a value of 100 will lead to ten points. The other color channels are not interpreted and can be used to make the areas distinguishable for the viewer. In this mode the ARES technology is used in order to control the mouse in Windows. Programs scripts and websites can be started directly from ARES. It is also possible to pass paramters to these programs and scripts. Therefore one can modify the file "MouseSimGames.txt" to add programs/scripts/websites to the selction. Every detected shot moves the mouse to the corresponding position and performs a left click. To achieve reloading neccessary in some games it is also possible to simulate right clicks afer an adjustible number of shots. The mouse simulator has been enhanced much in version 1.5 and now replaces the Arcade-Mode totally. All games that wehre playable with the Arcade-Mode now can be controlled with the mouse simulator.